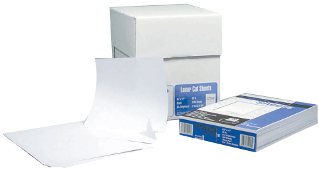 Alliance Processed Laser Cut Sheets are suitable for high speed copiers, laser printers, inket printers, offset processes and plain paper fax machines. All perforations are clean cut, leaving a "perfect edge" and allow sheets to run smoothly without any paper jams. File hole sheets are punched for smooth running and guaranteed top laser performance. Each standard file hole punch measured 5/16" in diameter. Each ream is sealed moisture and static proof, retail ready with UPC bar codes. Quality and satisfaction are guaranteed. Create customized forms for your company - Ideal for invoices, statements and medical charts. Cut clean microperfs and individually hole punched for guaranteed laser performance. Ideal for invoices, statements or sheets which require a user remittance. We offer a complete selection of horizontal and vertical perfed sheets. Perforations are cut clean, leaving a perfect edge and allowing sheets to run smoothly, without jamming in even the most sensitive printers or copiers. TST/Impreso, Inc. offers completed punching capabilities to meet exact needs for medical forms, delivery forms and filing requirements. Each sheet is individually punched for smooth running laser performance.